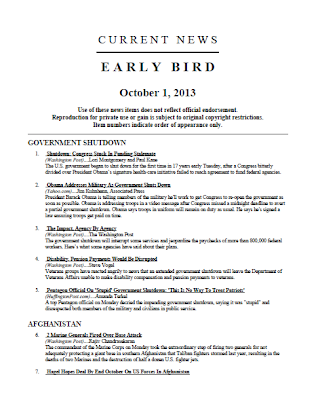 A screen capture of a .pdf version of the Pentagon's final published Early Bird daily press compilation. As we have seen in recent years--and will undoubtedly continue to see--in the print journalism sector, publications that were a significant part of the everyday lives of many thousands of people have been relegated to our collective memories due to the changing paradigms and business models of that industry. 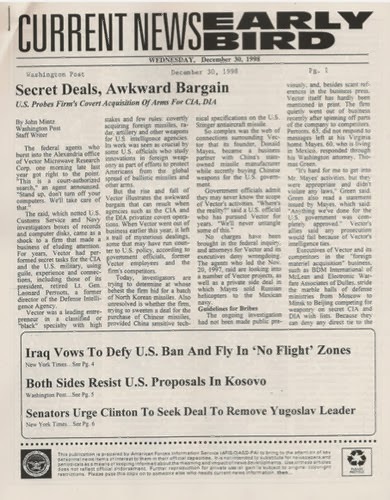 While not its own unique periodical, the Pentagon's Early Bird was, for many, their main source of defense and defense-related national security information and they never paid a subscription price for its contents during its near 50-year run that officially ended on November 1st. This December 1998 copy is an example of the first version of the Early Bird that I remember reading--a reconfiguration of dozens of press articles into a mostly readable publication. Tracing its historic roots back to 1948, the News Clipping and Analysis Service was formed in 1965 to consolidate a variety of military and civilian initiatives into one publication. The Early Bird moniker was formally affixed atop the multiple daily fax releases during the Vietnam War era that was distributed only to key leaders and commands. 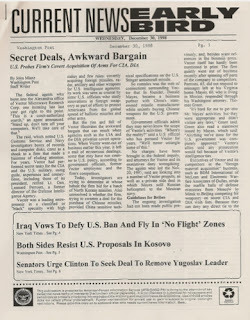 Utilizing the advances in computer and communication technology, it achieved greater fame in the 1990s and was circulated to a much wider audience via a DoD website (where estimates had it being read by over one million readers daily). It was during this time that I was first introduced to this service and I remember it as a reconfiguration of dozens of press articles put together into a mostly readable publication. What I liked about this product was that it provided readers the opportunity to get perspectives outside of the main wire services or "papers of record". In the pre-Internet days, having access to so many stories in a timely manner was a difficult and time-consuming proposal. I can still remember going to brick-and-mortar libraries to find newspapers on shelves--or even slotted poles--to read publications not available in the local area and to the microfiche area for those beyond the storage deadlines for the physical copies. 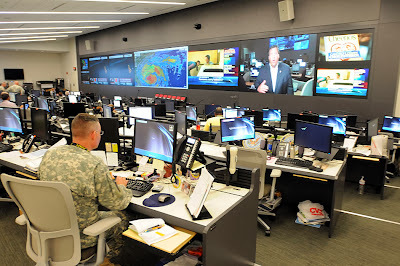 In the late 1990s and early 2000s, televisions and networked computers began to widely proliferate within DoD organizations and the Early Bird began to lose some of its prestige as a "go-to" publication for the latest news and opinions. Some claims of favoritism or manipulation of which stories or what kind of items to include have circulated over the years (for example, during the George W. Bush presidency, defense secretary Donald Rumsfeld directed his staff to list corrections made by papers critical of the administration for prominent posting in the publication). I would think that having one of your stories run in the Early Bird would be a nice pat-on-the-back for a journalist to get (I personally commended several local Dayton reporters when I saw their work featured there). 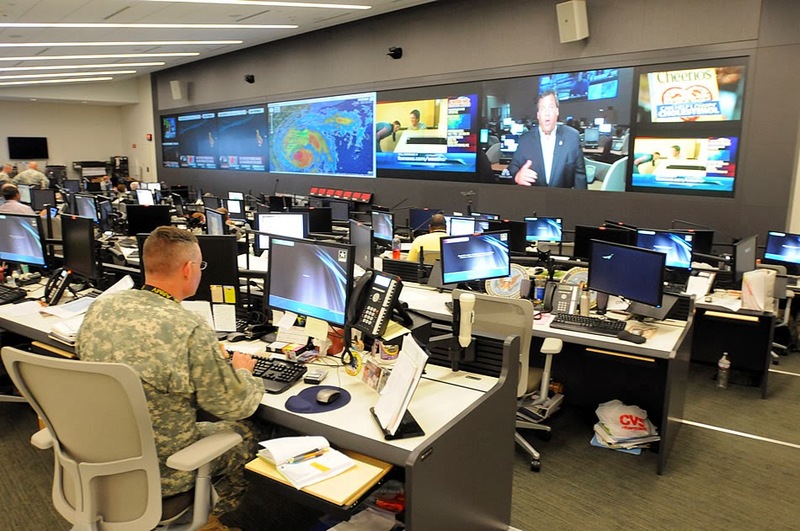 One private initiative by the Military Times and Defense News outlets is trying to fill the news void with their own daily news compilation service. The Pentagon office that compiled the articles was affected by the recent government shutdown and the chief of the Defense Press Office decided to keep it closed after other DoD organizations were reopened (the permanent closure was announced on November 1st). They will still be producing daily press rundowns but they will be for a small circle of top military officials who, coincidently, were the original audience for those Cold War-era reviews. 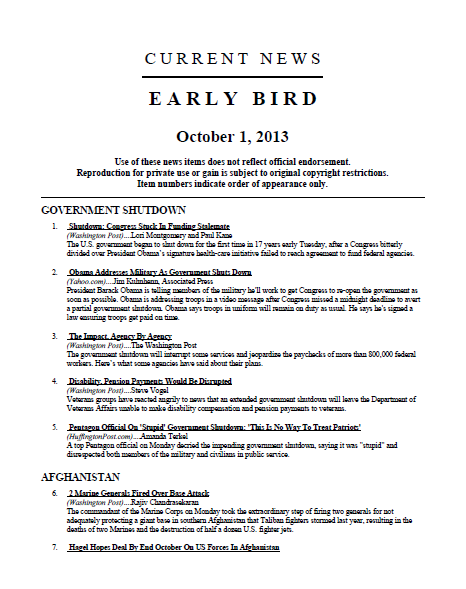 To fill this news void within the US defense community, a private initiative by the Military Times and Defense News--two Gannett Government Media outlets--has started the Early Bird Brief, an email-delivered product that provides a concise review of press items that it deems important to its subscribers. Since I have not seen any of their briefs, I will reserve judgment on the specific content but I cannot see how independent this publication can be when it is produced by an organization extremely intertwined with corporate defense interests and not by elements of the policymakers themselves. Unfortunately, this is not an isolated because such objectivity between the story and the storytellers has become increasingly scarce in today's entertainment and profit-centric media environment.